As permafrost (frozen ground) thaws, it releases heat-trapping gases into the atmosphere, which accelerates global warming. It also alters local ecosystems and destabilizes infrastructure, necessitating costly repairs. See how global warming is undermining the stability of the MacKenzie River basin in Canada—and find other hot spots threatened by higher ground temperature on the Climate Hot Map. Permafrost—an essential component of many high-latitude landscapes—is soil or rock that remains at or below 32° F (0° C) for at least two years. In Arctic regions, permafrost temperatures often sink to 17.6° F (-8° C) or lower. 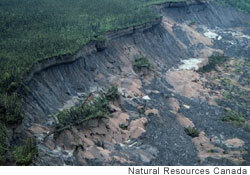 Permafrost averages 656 feet (200 meters) thick, but can be as much as 2,132 feet (650 meters) thick. Permafrost is very sensitive to direct changes in air temperature and snow cover, making it especially vulnerable to global warming. And as permafrost thaws, it can release both carbon dioxide and methane from carbon often stored in soil for thousands of years. (The type of heat-trapping gas the permafrost releases depends on moisture conditions, and whether the permafrost has contact with air.) The thawing of the permafrost can therefore worsen climate change. The thawing of permafrost in northern forests could completely alter local ecosystems. Existing thawing is already destabilizing the human infrastructure, which require frequent repair. Scientists typically measure the temperature of permafrost near the top of the "active layer," which freezes and thaws seasonally. Scientists may also drill a borehole to measure temperatures deep below ground.